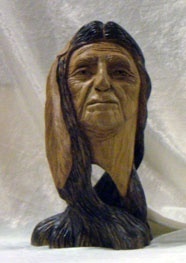 A member of the Rock River Valley Carvers of Wisconsin, Jim Trumpy has been a woodcarver for many years. Known for his depictions of birds, Native Americans, and cowboys, Jim also has a bit of whimsy in him. His current work here at the gallery is a "gnome home".